We have finally settled in. Well you know how that goes, settled for now. I'm always changing things up! The day after Thanksgiving is usually when we head to the tree lot for our Christmas tree and the house decorating is about finished by the Sunday after. I haven't been able to stick to that schedule this year due to the renovation. So before I start bringing in Christmas, which will hopefully be today (yippee! ), I wanted to share how we've settled in! I was so hoping this would turn out to be a cozy space, and it has. 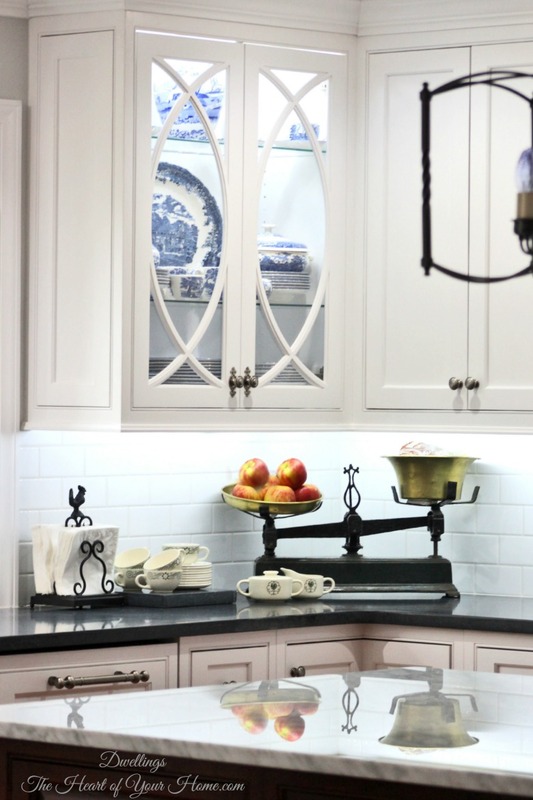 The antique scale I found a few months back has found a home..
We had a hard time deciding on seating for the island. We purchased the chairs from Joss & Main, they are perfect with our farmhouse style table. I know what some of you may be thinking, a glass top farmhouse table? Yep! The clock was a kitchen warming present from our daughter, she knows me so well! 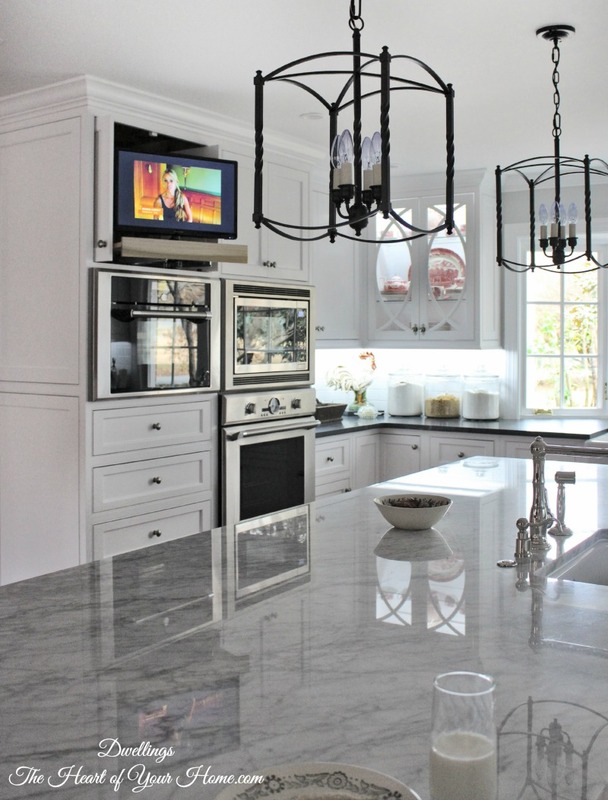 One of my favorite features in the kitchen is the TV. Just behind the window sink is a little more blue and white. I can't wait to begin decorating for Christmas, I bet you are finished aren't you? our farmhouse style table transformation here. You've arranged everything so beautifully Cindy !! Love your kitchen, continue enjoying it dear! Oh, it's just beautiful, Cindy!! I would want to spend the entire day in there! :) I know you're enjoying putting this all together and it will be great fun to add Christmas touches too. 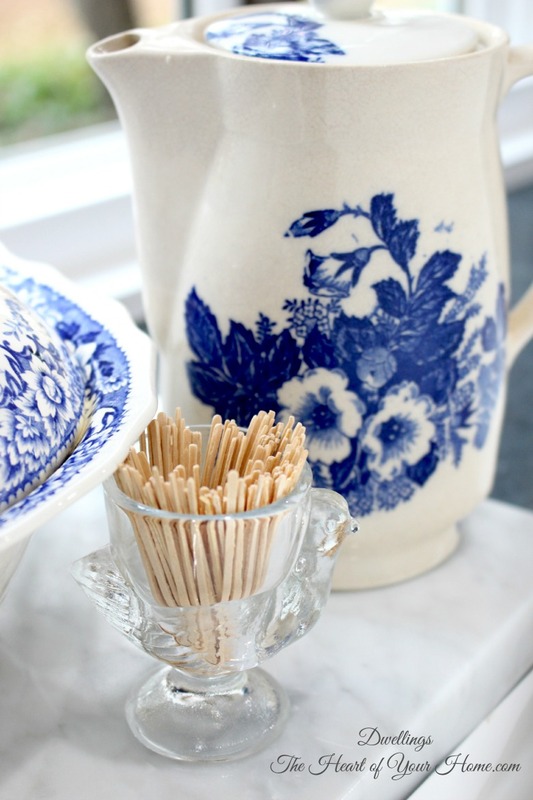 I love the natural light and the cozy factor, and your Wedgwood dishes are beautiful. I'm definitely not finished with decorating. I have one tree done, and that's it -- lots more to do. I hope you have a great day! 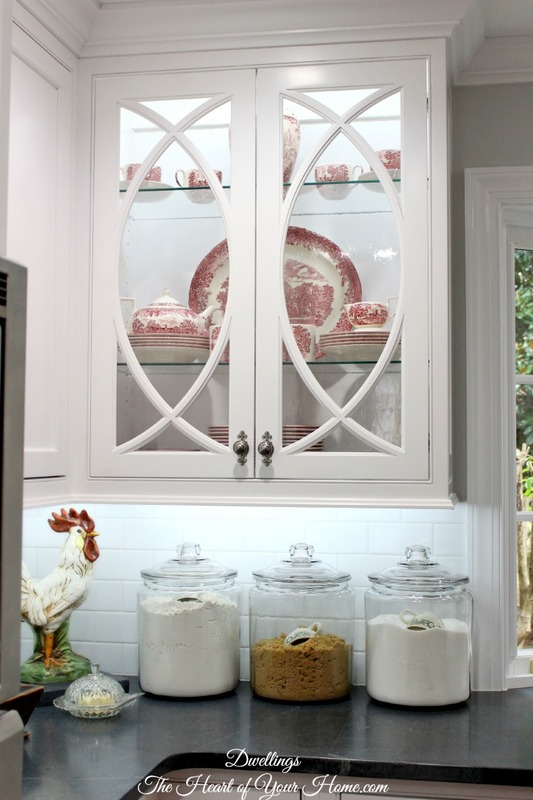 Cindy, your kitchen and keeping room are beautiful! It really does have a cozy annd inviting feel. I am sure you are enjoying your new space immensely! Wow, Your kitchen is amazing! I would love to have that big, gorgeous window in my kitchen. Currently I have one tiny one by the stove. 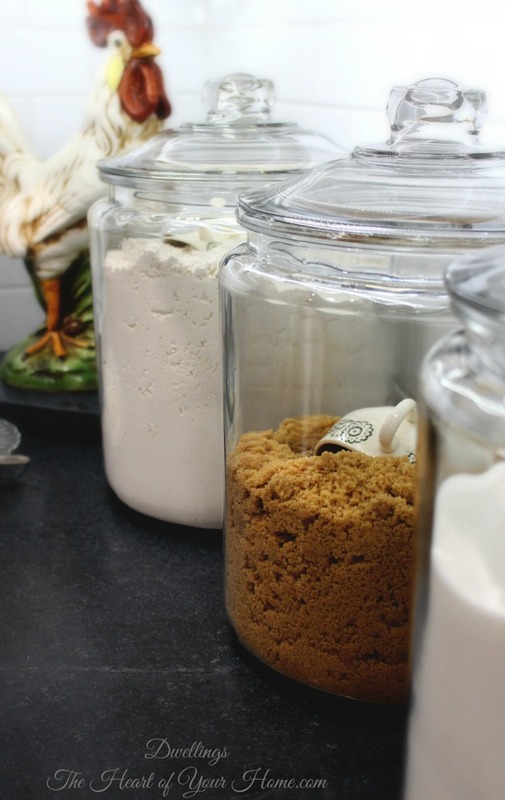 Everything in your new kitchen is so beautiful and works perfectly together, love it! Your kitchen is beautiful and I LOVE it. 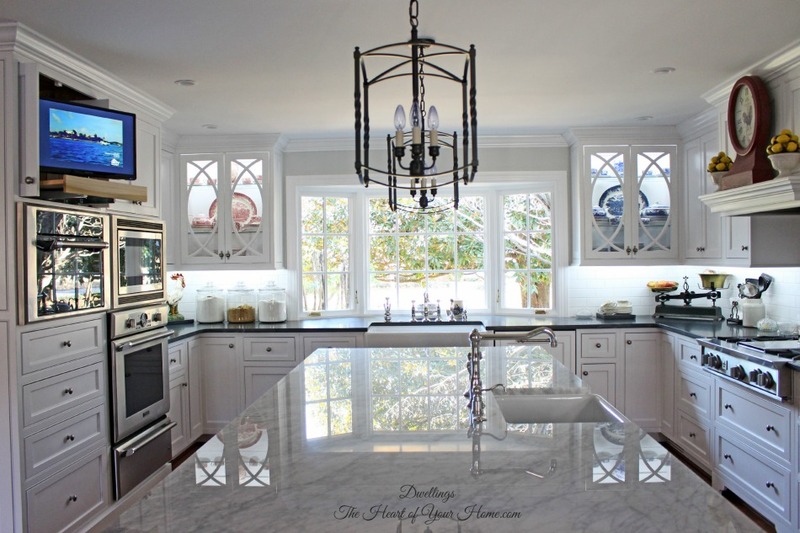 The arrangement of cabinets, appliances, island - and that beautiful window. Perfect! 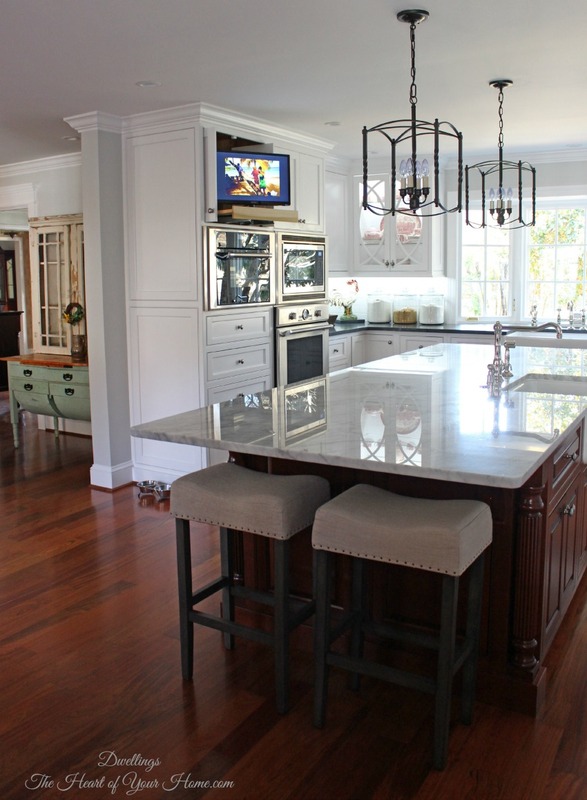 Cindy, I just love your beautiful kitchen! I know you've had fun decking it out. Your dishes are so pretty as seen in the glass. The clock your daughter gave you is perfect! I love the light shining in and the scale you recently found. Man, I'd live in that kitchen! 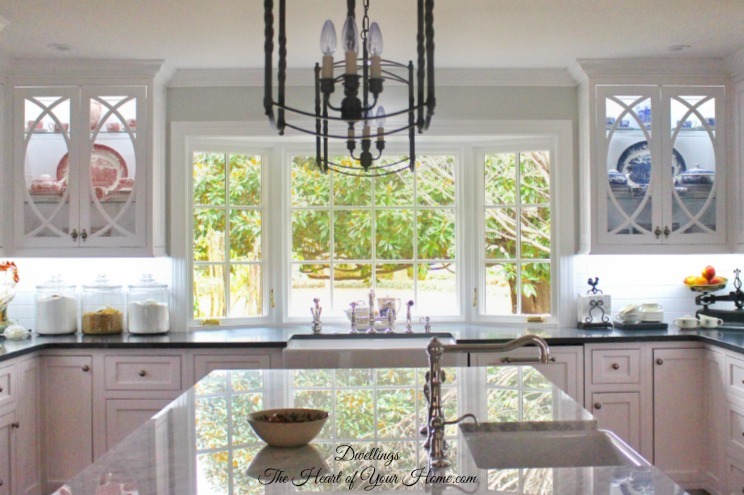 Love your kitchen... and THAT WINDOW is awesome! Cindy, your new kitchen and keeping room are beautiful. 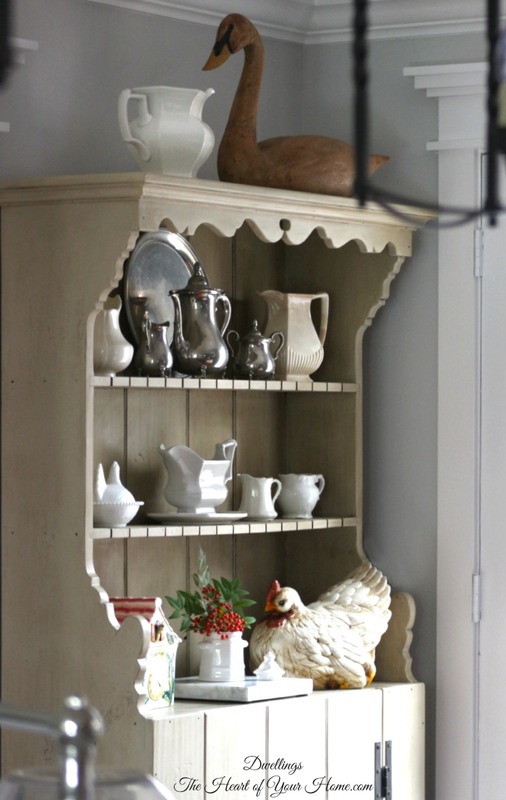 Your curvy cupboard, dressed in its Christmas best, is such a charming feature. I think I'd spend the better part of my mornings right there next to it, nestled in a cozy armchair, enjoying my first cup of coffee and planning my day. Enjoy it! It's just a big new country kitchen full of awesomeness! I love every bit of it...and the red clock from your daughter is the perfect touch! Absolutely beautiful Cindy...I love it all!! 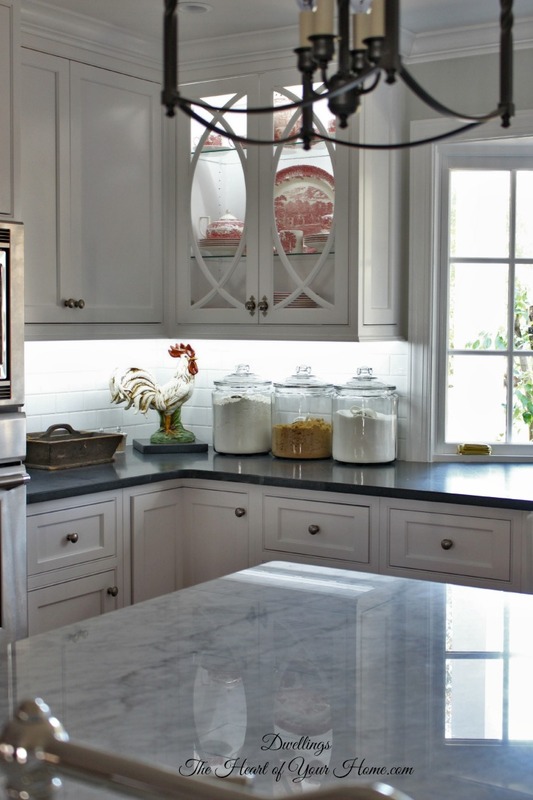 Your kitchen just couldn't be any prettier. 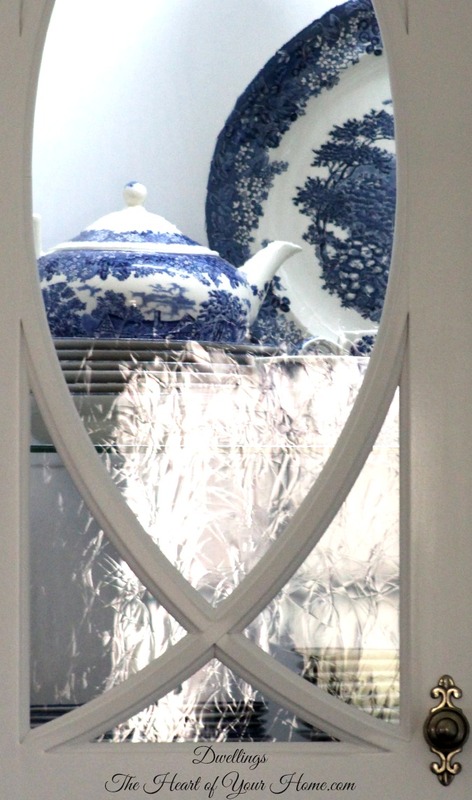 Your transferware looks amazing peeking through the beautiful glass doors. Love it all!! It's all just gorgeous Cindy! Well done! I'm still loving every bit of your kitchen, Cindy. Beautiful job. It's gorgeous!!! Love how you have put it all together and just in time to enjoy it during the holidays. Beautiful, Cindy! I would love to see this room after your decorate for Christmas. A white kitchen is a great backdrop for the Christmas colors. This is absolutely beautiful. I love every detail. I'm so glad you have a pretty window. Rooms without windows are like little girls without big hair bows! Congratulations, and get busy cooking! Yes, I agree with all the above comments, just beautiful and so warm and inviting. You have done an excellent job with everything and I know your Christmas decor will only add more beauty. Happy weekend! 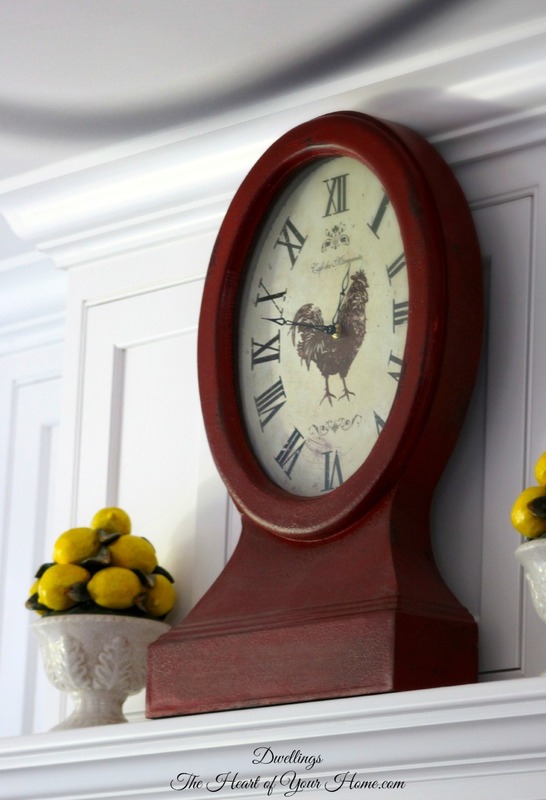 front cabinets, and I can see you found just the perfect spot for your daughters gift, that is such a neat clock, love it. nature lover............can't wait to see it all guzzied up for Christmas.........Know you are really enjoying it. Cindy, I just LOVE your new kitchen! And what a wonderful testimony to the Truth that God DOES gives us the desires of our hearts! It is just beautiful and I am so very happy for you! 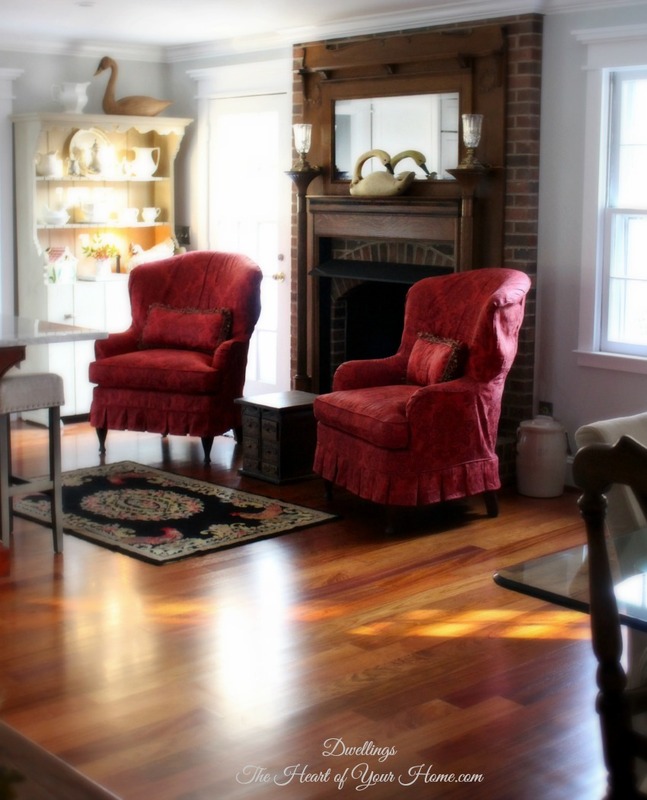 Right now I live in a Colonial style home in the northeast. 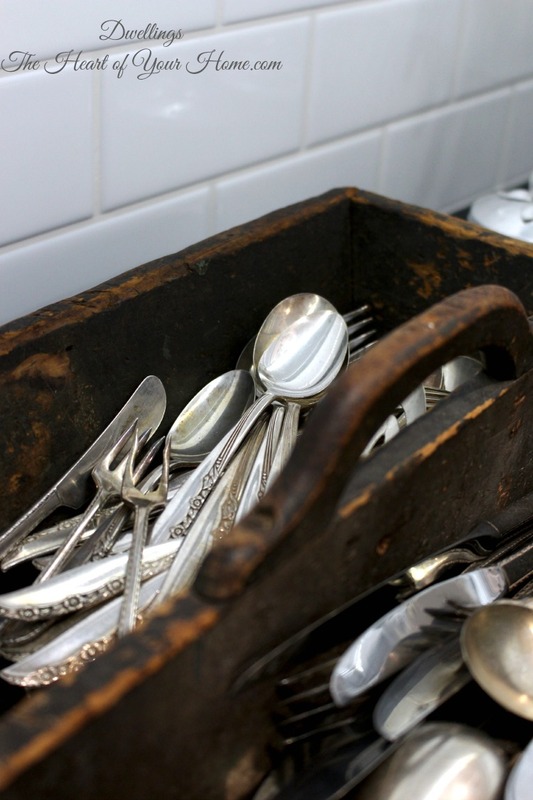 I am a widow and empty nester so I want to down size soon and my desire is to move to a smaller place but with lots of room to display my large collection of Depression glass...Sounds crazy but I believe God can do that! Have a blessed Christmas decorating your lovely home! 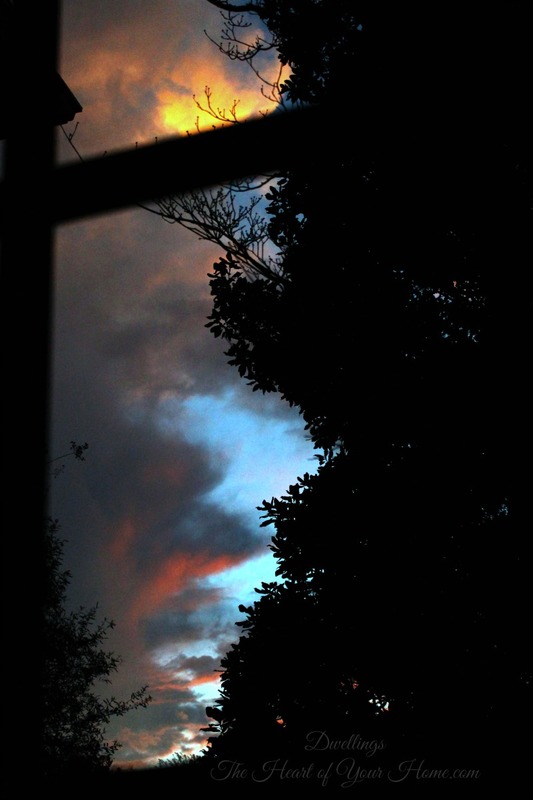 The sunset is beautiful, you must spend quite some time watching by that gorgeous window! 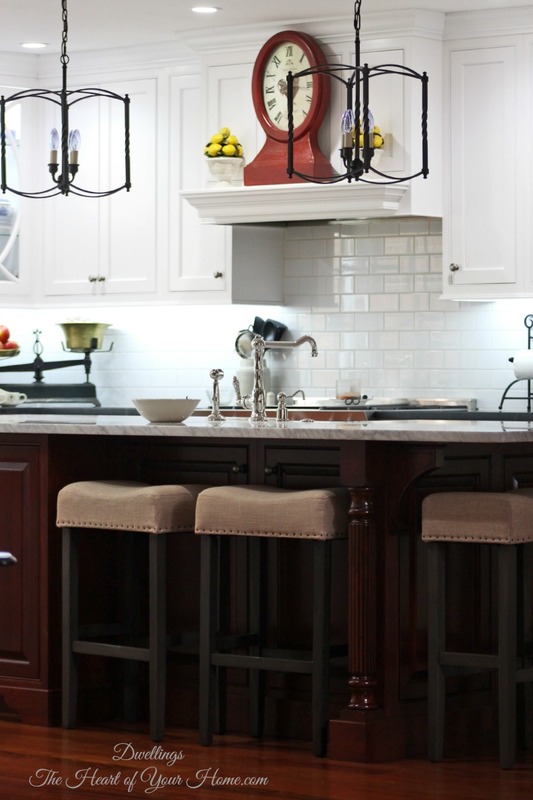 Beautiful, gorgeous, warm & inviting are all words that come to mind when looking at your kitchen, Cindy! Pea green with envy are words I'm trying to keep at bay....lol! You so deserve this wonderful space after waiting so long. Man Cindy! You have to be loving that kitchen! So pretty!~ Thank you for joining Home Sweet Home! I will feature it again this week at HSH! Oh, Cindy. What an amazing space you've created! Thank you so much for sharing it at Grace at Home. I'm featuring you this week--after getting a taste of it before, I know people are going to want to see it now that you're all moved in. And I for one can't wait to see it all decorated for Christmas! Your kitchen is GORGEOUS!!! I love it all!! !